Full title: 'India Orientalis et Insulae Adiecentes'. Printed in Frankfurt. 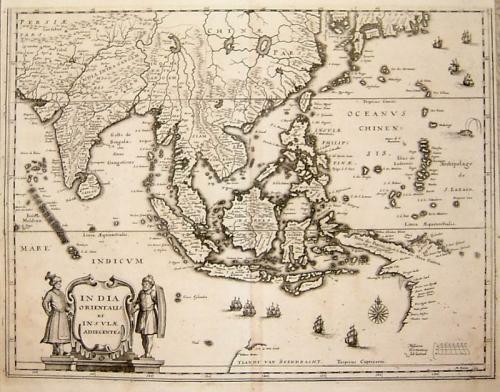 Merian's decorative map of Southeast Asia, India and western Oceania is based upon the work of Blaeu. The map is finely detailed and is embellished with sailing ships and an elaborate cartouche. Of interest is the partly formed configuration of Australia that is linked to New Guinea. Seldom seen on the market. In very good condition and a strong imprint, although the side margins are a little tight.